Greg Smallwood creates a vintage-look cover! "Has DC Comics done something stupid today?" Find out here. 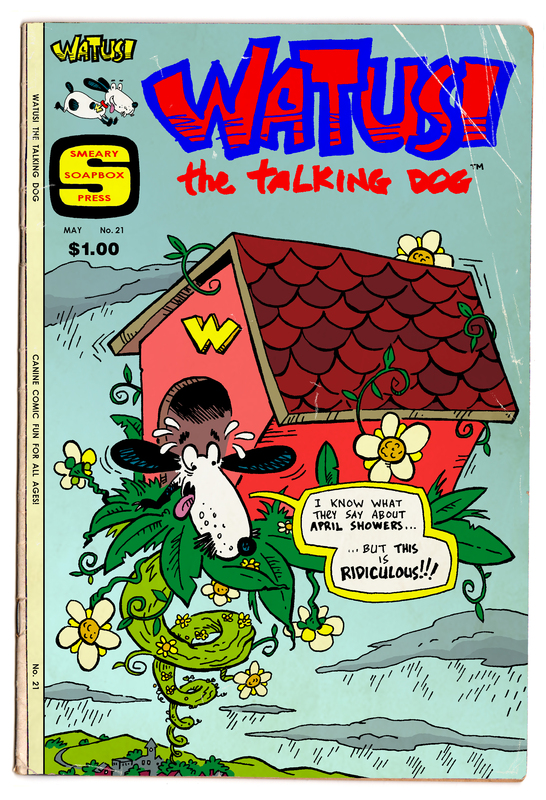 … if you already read my Watusi the Talking Dog comic online– or maybe especially if you DON’T– what kind of information did/would you like to know before you dive/d into a new body of work? 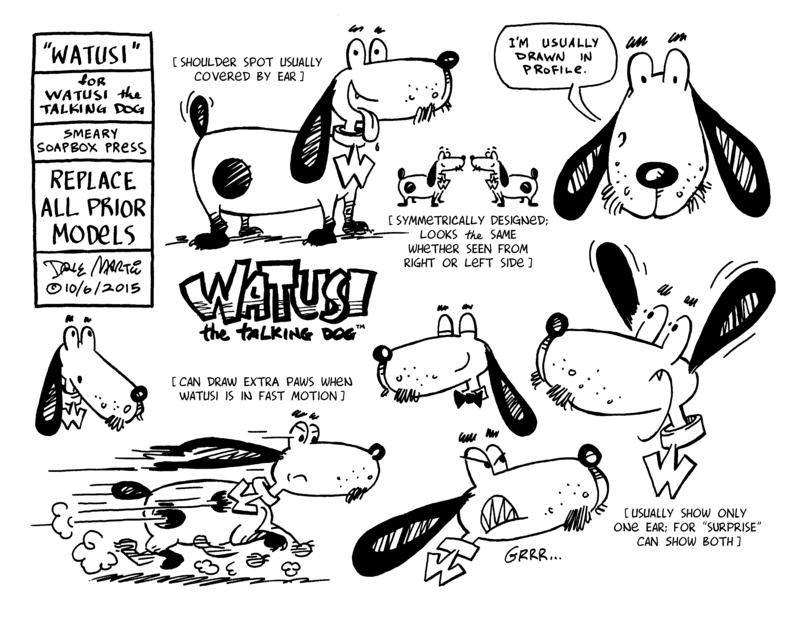 After nearly 10 years and more than that many different storylines, I feel the need to provide an easy introduction for new readers … so I’m assembling a webcomic primer issue of Watusi to serve that function. While I try to make work that is accessible to new readers, I’m often too involved in the process to see things from the reader’s POV. I would love to quench your thirst for understanding (& give you a better reading experience)! At the end of every year I send out a holiday piece to friends and family who have had an impact on my life during the year, but as my audience has grown to include readers (via website visits, Facebook, Instagram, & Twitter follows) I don’t know personally, I want to share the joy with my “virtual” friends as well. Thanks for taking the time to visit this blog or follow my weekly Watusi webcomic. It’s much appreciated! At the end of every year I send out a holiday piece to friends and family who have had an impact on my life that year, but since my audience has grown to include readers (via website visits, fb & twitter follows) I don’t know personally, I wanted to share the joy with my “virtual” friends as well. Thanks for taking the time to visit this blog or follow my weekly Watusi webcomic. It’s much appreciated! Of course, the irony is not lost on me that I had to leave Kansas behind before I got around to writing my “Watusi in Oz” story. But that’s what it took, I guess. And even if I wasn’t able to incorporate as many collage elements as I’d planned, I’ve been happy with how the story has developed, and think it pays proper homage to the work of Baum & Denslow. There’s lots still to go on the story, so check it out— I’d love to hear what you think about it, especially if you’re a fan of the original books! 2017 also saw my first dip into crowdfunding via Patreon (look for a special patron-only webcomic coming there next year) and stepping away from comic work to do more “fine” art– including paintings, prints, and even a 3D piece for an exhibit as part of Memphis’ Crosstown Concourse grand opening. Best wishes for a happy 2018! 82.6% of readers read the text blurb following my comic, too, so I’ll keep using that to plug upcoming shows and comic releases. I also like it as a way to provide context or commentary on the strip. At the end of every year I send out a holiday piece to friends and family who have had an impact on my life that year, but since my audience* has grown to include readers (via website visits, fb & twitter follows) I don’t know personally, I wanted to share the joy with my “virtual” friends as well. 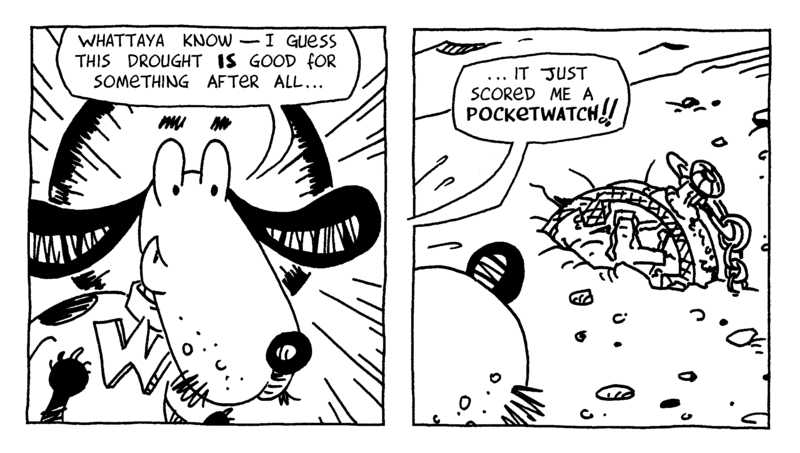 Thanks for taking the time to visit this blog or follow my weekly Watusi webcomic. It’s much appreciated! 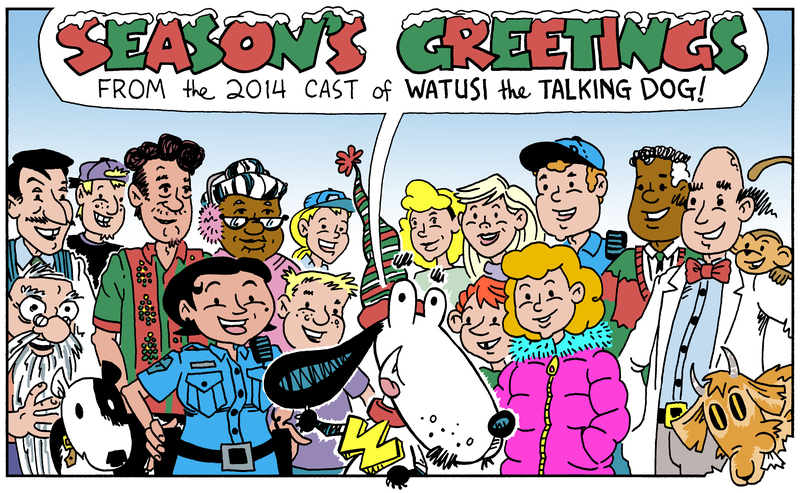 Longtime readers may recognize this year’s holiday piece as a reworking of the one from 2009 … but since 2016 finally saw the print edition of that year’s Watusi webcomic storyline (as the 7-issue “Watusi and the Emerald Serpent” miniseries) and an accompanying book tour, it seemed like an appropriate recycling effort to represent the year that was. Best wishes for a happy 2017! It’s time for me to rein extraneous activities in for a bit, and buckle down to my drawing table. I’ve got big plans for my fall convention schedule (confirmed: Memphis Comic Expo, Oct. 22-23 and Air Capital Comiccon, Nov. 12-13) and holiday market events that will I feel will be a better use of my time than posting just to keep on a set schedule. I’ll continue to pop in from time to time with some art or an update on my project, but it will be on a less rigid– and more infrequent– schedule. Thanks for reading and enjoy the rest of your summer! When my friend (and Watusi jam participant) JB Winter first pitched me “InkTober”, a drawing challenge to do one ink drawing a day for the entire month, I wasn’t initially interested in participating. After all, I figured, since I draw in ink all the time, it’s really not that big of a challenge to me. After checking out Inktober instigator Jake Parker‘s website on the project (including his review of his go-to inking tools), and seeing some of the amazing drawings that participants produced during the first few days, I figured I could at least do the “5K” option of posting once a week. So I decided to indulge my general love of model sheets and draw up some decent ones for four members of my Watusi cast. If nothing else, having that reference should help me be able to keep my characters in proportion to each other! For those of you who missed them on my twitter feed, I’ve collected them here for your enjoyment.! Overall, I’ve been pretty happy with my career as a self-publishing cartoonist. It’s afforded me the freedom to tell my stories my way, and craft a finished product that reflects my sensibilities without the intrusion of outside ads or editorial mandates. But if there was any publisher I could see my work fitting in with, it would be Harvey Comics of the 1970s. At the end of every year I send out a holiday piece to friends and family who have had an impact on my life that year (although it’s usually at the start of the new year by the time I complete them). This year I made just a plain ol’ greeting card, and thought I’d share it with my virtual audience, too. Thanks for taking the time to visit this blog or follow my weekly Watusi webcomic. It’s much appreciated!